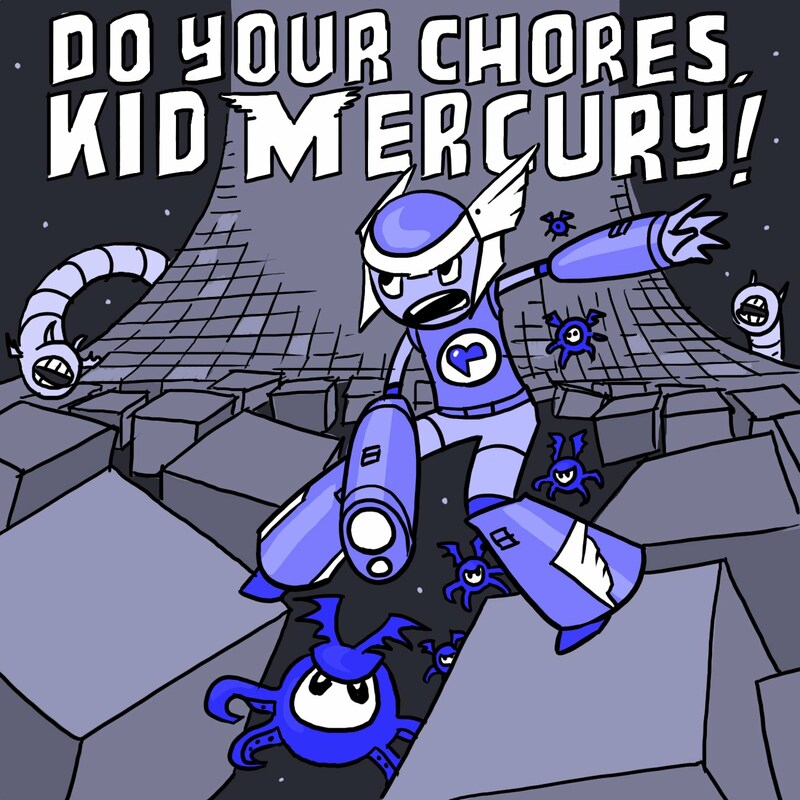 Do Your Chores, Kid Mercury! Kid Mercury has a long list of chores to do every day. He has to run, jump and blast bad guys. He has to collect coins and heart pieces. He has to find hidden treasures and power-ups--he even has to rescue princesses. What a boring life. So many chores! If only he could spend more time doing his favorite things. Things like homework, cleaning his room and taking out the trash. He wishes he could do those things all day. I've noticed there aren't many video game-themed picture books. And I haven't met many kids who weren't interested in video games. The general feeling I get from parents is that games are somehow anti-reading. I totally disagree, I grew up reading and playing games and enjoyed both equally. I still do today. This guy, Kid Mercury, is a mix of a few of my favorites characters from the original Nintendo Entertainment System. Can you guess who? Nice role-reversal story in an environment familiar to both children and adults. Mega Man was just that - mega. I never knew that he would have just preferred to match socks from the laundry basket all day. This is a funny switch, Nate. :) I really think there's something here. Wow! First ones out fo the gate. Kid Icarus and Mega Man it is! Jed, this HAS to be about video games because of the chore-like nature of most games. Most games really are just a series of To Do lists. Besides--I'm way more into games than movies! I would like to testify of Nate's love of video games over movies...plus his love of Kid Icarus and Mega Man (which he always beat me in). I'm surprised there is no original Metroid in the mix. Ha ha. I'll work Metroid in there somehow. I had Kid Icarus, but you had Mega Man 2--easily the best of the Mega Man games. Such awesome music! Now I'm humming the music in my head. I can believe how many times I've woken up in the mornings and faced a monotonous list of turtles to jump over, and jewels to bounce off my head. When will I ever get to relax over a good toilet scrubbing? Fun idea! good luck with the marathon. Here's mine. This one's still my favorite:) Good job!